Since 1981, RCS has been the ace in the hole for retailers looking to succeed. Our clients depend on our extensive expertise to restructure, optimize, manage and grow their real estate portfolios. 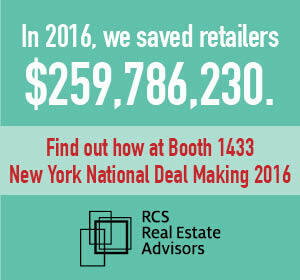 Contact us to schedule a meeting at the NY ICSC or stop by our Booth to see how we can help you improve your bottom line. Last year at this time I commented on how the trends I was seeing indicated that 2016 could end up being difficult for retailers, just like 2008 was. It turns out 2016 was indeed a lot like 2008. There were numerous large bankruptcies and many retailers struggled with misaligned occupancy costs as a result of lower sales. Well, it seems like we have seen this movie before. 2017 is looking to be very much like 2009 with more of the same that we saw this year. Most mature retailers we speak to are still looking to not only reduce their costs, but to also reduce their footprint. In general they are feeling like this country is “over-stored” and the Internet is continuing to have a big impact on store sales. In 2016, we saved our clients $259,786,230. Isn’t it time you called us to see what we can save for you? RCS congratulates client PacSun on their emergence from Chapter 11. RCS is pleased to have operated as Real Estate Advisor to PacSun and to have been a key part of their successful efforts to restructure. PacSun was acquired by affiliates of Golden Gate Capital and is now better positioned for the future. RCS President and CEO recently sat down with the New York Real Estate Journal for a question and answer session about the strategies RCS uses to help clients improve their bottom line. To read more, including advice Ivan has for retailers, click here..
Perspectives is a quarterly newsletter for current and prospective clients.